Refrigerated counters have been witnessing strong demand globally majorly due to the growing presence of restaurants and food chains around the world. The refrigerated counters market is mostly concentrated in North America and Europe owing to a large number of hotels and catering service providers in these regions. The emergence of new hotels and cafes in response to the ever-growing tourism industry in developing countries is also likely to support the growth of the refrigerated counters market. The implementation of government regulations to control energy consumption and reduce the use of harmful refrigerants is expected to boost the replacement demand for refrigerated counters among end users in the coming years. Increasing stringency of food safety and quality regulations are also anticipated to support the market. The revenue of the global refrigerated counters market stood at US$4.5 bn in 2015; this is projected to expand at a CAGR of 7.7% during the forecast period to reach US$8.7 bn by 2024. System catering emerged as the leading end-use segment of the global refrigerated counters market and is estimated to account for a massive 80.9% share by the end of 2016. However, the segment is expected to lose a marginal share in the market by 2024 owing to the rising demand for luxury hotels across Europe and Asia Pacific. The hotels segment, as a result, will exhibit a 9.3% CAGR in terms of revenue from 2016 to 2024. Within the system catering segment, quick service restaurants (QSR) are expected to contribute the highest revenue to the overall refrigerated counters market. The QSR market is expected to grow significantly in the coming years owing to the growing fast-food culture in developing countries and the rising disposable incomes of the consumers. North America was the leading regional market in terms of revenue in 2015 and the demand for refrigerated counters is expected to increase in hotels and full-service restaurants in the coming years. The U.S. is expected to be a significant contributor to the refrigerated counters market in North America. Europe is anticipated to account for a consistent share in the global market during the forecast period owing to the rising implementation of government regulations in order to curb the consumption of energy and the usage of refrigerants in refrigerated counters. The Europe refrigerated counters market is projected to expand at a CAGR of 6.6% from 2016 to 2024. Asia Pacific is expected to exhibit increased demand for refrigerated counters in the coming years due to the growth of the organized hospitality sector. Countries such as China and India are expected to witness a significant adoption of refrigerated counters in hotels and quick-service restaurants. The Middle East and Africa (MEA) and South America markets, on the other hand, are expected to contribute less to the global refrigerated counter market in the coming years as compared to other regions. Some of the major players in the global refrigerated counters market are Illinois Tool Works, Inc., Electrolux AB, Inomak S.A., Turbo Air Inc., The Manitowoc Co. Inc., Standex International Corp., Dover Corp., Continental Refrigerator, True Manufacturing Co, Inc., Avantco Refrigeration, Angelo Po Grandi Cucine s.p.a., Ali S.p.A., Afinox srl, Coldline srl, The Middleby Corp., Inoksan Group, and Infrico S.L. Refrigerated counters are commercial refrigerators which are designed especially for kitchen/cooking area of hotels, restaurants and catering services. These counters come with a wide range of temperature control options (typically from -15 to +10 degrees). The refrigerated counters are expected to witness strong demand globally majorly due to growing professional restaurants and food chains. Majority of the refrigerated counter market is concentrated in North America and Europe due to large number of hotels and catering service providers in these regions. This research report provides an in-depth analysis of the global refrigerated counter market based on product, design, end-user and geography. The global refrigerated counter market is categorized based on product types into refrigerator counter and freezer counter. Both segments are further sub divided into gastro universal pan/gastro-norm (GN), others (without standard dimensions), counters (euro-norm - EN) and chef base counters. Furthermore, the report provides complete insights into different counter designs through by design segmentation, which includes with door, with drawer, with prep-table-top, and with saladette top segments. These segments are categorized by refrigerator and freezer counters respectively. 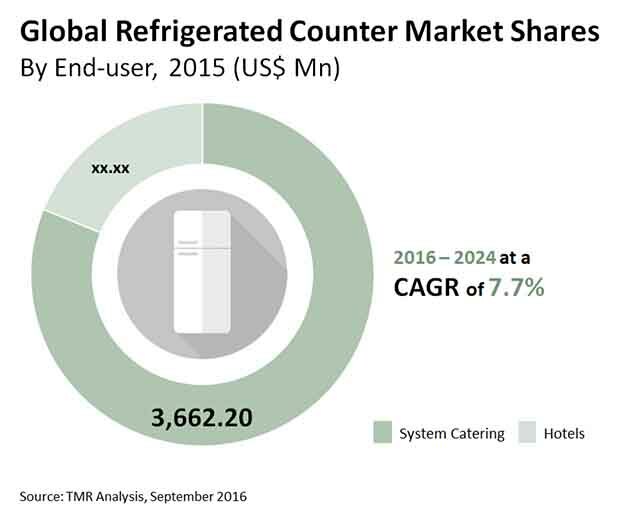 The end-user segmentation for the global refrigerator market includes hotels, and system catering. The system catering segmentation is further categorized into quick service restaurants, catering services, location specific catering, and full service restaurants. The report analyzes each of these segments for the various geographies considered under the scope of the study. Based on geographical regions, the report segments the global refrigerated counters market into North America, Europe, Asia Pacific, Middle East & Africa (MEA), and South America, which are analyzed in terms of revenue and volume. North America is further segmented into the U.S. and Canada, while Europe is divided into the U.K. and Germany. Asia Pacific is subdivided into China and India. Also, MEA is further segmented into South Africa and the UAE, while South America is subdivided into Brazil and Argentina. The report further provides a cross-segmentation analysis of the segmentation as per the countries. The report also provides an analysis of the factors that drive and restrain the growth of the refrigerated counter market. It discusses the prevailing market trends, prospective growth opportunities, and major strategies increasing the popularity of the global refrigerated counters. It provides market estimates and forecasts for all the segments in terms of revenue and volume. Also provided in the report is the market share of key players for year 2015. The report also provides industry evolution, global frozen food sales overview, global quick service restaurants network overview, price trend analysis, value chain analysis, and Porter’s Five Forces Analysis for the global refrigerated counter market. Major business strategies adopted by key players, their SWOT analysis, and competition matrix have also been identified in the research report. The key market players profiled in this study include Illinois Tool Works, Inc., Hoshizaki Electric Co. Ltd., Skope Industries Ltd., Electrolux AB, Inomak S.A., Turbo Air Inc., Liebherr Group, The Manitowoc Co. Inc., Fagor Industrial, Standex International Corp., Dover Corp., Continental Refrigerator, True Manufacturing Co, Inc., Avantco Refrigeration, Angelo Po Grandi Cucine s.p.a., Ali S.p.A., Afinox srl, Coldline srl, Samaref srl, The Middleby Corp., Cool Compact Kühlgeräte GmbH, Inoksan Group and Infrico S.L.